In a little less than 5 weeks the new catalog will be available. 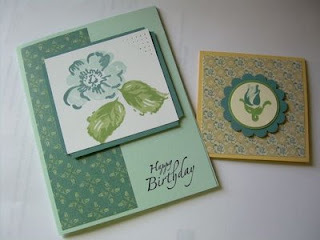 One of the stamp sets that I'm enjoyed is the Wild Rose on page 88 of the current catalog. The 2 step stamping set has various sizes of roses. The large rose would be awesome done on a wall in a home. There are many who are intimidated by the 2 step process of stamping. The stamp-a-ma-jig found on page 184 eliminates the frustration of laying one imprint over another. This marvelous tool is so easy to use. I'll be happy to show you other uses for this great product. Remember tomorrow is the last day to order from the Occasion Mini.